-, with the King, 465. 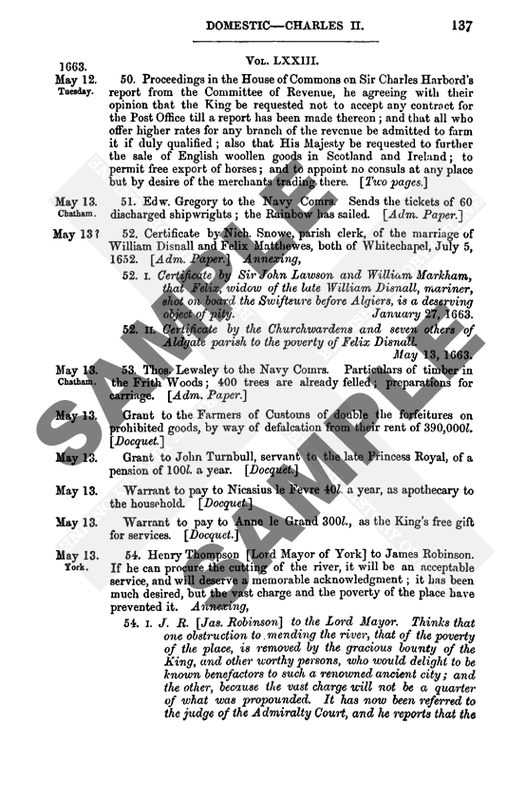 Oatlands, letters of credence dated from, 381, 417. Occhiali, 'Lucialli,' Turkish Admiral, 257. Offley, , English Papist in Paris, 279. Ogilvy, Ogleby, James, Lord Ogilvy of Airlie, 162. -, Ogleby, James, master of, 162. Oldensael, 'Oldezele,' 268, 454, 476. -, Spanish ambassador in Rome, 373, 515. -, mentioned, 500, 508, 509, 514, 524. Olleytt, , English Papist in Paris, 279. Omer, , English Papist in Paris, 279. Ongnies, Franois d', Seigneur de Willerval, Governor of Douai, taken prisoner, 349. Oost, Oste or Oegst, Captain Nicholas, of Limborch, offers his service to Queen of England, 82. Oporto, Porto, 'the Port,' 412, 413, 437, 472, 488, 491, 503, 511. -, letter dated at, 437. Orange, Prince of. See Nassau, William of. -, Princess of. See Bourbon, Charlotte de. -, Mlle. de. See Nassau, Marie of. -, mentioned, 316, 327, 395, 398, 405, 425, 443, 447, 483, 495, 500, 502. -, letters dated at, 288, 439. Ormond, Earl of. See Butler, Thomas. Orrell, , of Lancashire, English Papist in Paris, 279. Ortis, Captain, killed before Maestricht, 20. Orton, , English Papist in Paris, 279. -, English Papist in Paris, 279. Osnabrck, Osenborch, Bishop of, 231. Otwell, , English Papist in Paris, 279. Owen, , , Welshmen, Papists in Paris, 279. -, , Englishman going from Spain to Prince of Parma, 72.